Hundreds of officials, a red carpet 80 meters long, flags, tribunes, and more await the US president upon his landing at Ben-Gurion Airport. The Directorate of Military Intelligence (Aman) at the Defense Ministry, which is responsible for holding the reception for US President Donald Trump at Ben-Gurion Airport next week, is currently completing the preparations for President Trump's visit to Israel. As part of the preparations, a secure complex will be constructed at the airport that will accommodate hundreds of VIPs, officials, and 300 journalists from Israel and around the world. At the center of the ceremony will be a red carpet of 80 meters (300 feet) in length, a 250-seat tribune, a platform for hundreds of journalists and photographers, a stage of photographers, a speech platform, a complex for dozens of broadcast vehicles, photo and lighting towers. 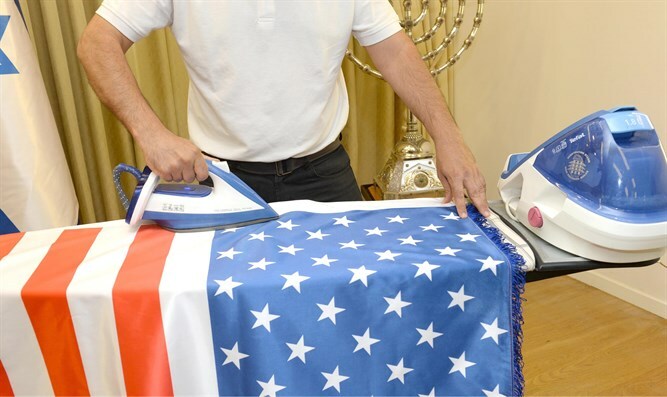 Hundreds of flags of Israel and the United States, as well as hundreds of bouquets of flowers, will be placed throughout the plaza, with special emphasis placed on security, in order to ensure the proper management of the ceremony. Dudu Chen, the head of Aman, said that "from the moment the mission is received, the Defense Ministry's Operation's Directorate works around the clock to ensure that the event will be held in an exemplary manner, both in preparation and in execution." "During visits by previous presidents, and during the Pope's visit, the Defense Ministry was in charge of the complex operations and our professionals have accumulated considerable experience in VIP visits, and we will conduct the operation sensitively and professionally from the moment the presidential plane lands down to its departure from Israel." The employees of the President's Residence are also working on the final details ahead of Trump's visit, which will start at the reception at the President's Residence. The red carpet was cleaned and spread, flags of Israel and the United States were ironed and arranged, new seedlings were planted, and media platforms and speeches were set up in honor of President Trump. All this was to ensure that the moment the president of the United States and his wife, Melania, leave their vehicle and march alongside President Reuven Rivlin and his wife, Nechama, on the red carpet, the President's Residence will look its best. The President and his wife will receive President Trump and his wife at the President's Residence, and from there the two will enter the President's Residence, where President Trump will sign the guest book. Afterwards, the two will begin a short session in the parlor and then leave for the President's Residence, where they will make statements to the media. Harel Tobi, the head of the President's Residence, said: "We have been preparing for the visit by US President Donald Trump for many weeks and have invested a lot of resources in order to celebrate the strategic relations between the two countries and to ensure that this meeting will strengthen relations between the two nations and the needs of the State of Israel. This visit is of political and symbolic significance because of the exceptional friendly relations between Israel and the United States, and as appropriate, the President's Residence is held for extraordinary hospitality."